Mac: GarageBand, Apple's free virtual music studio, recently updated its Mac version to include free lessons from your favourite singers, songwriters and rocking-outers. With these Artist Lessons, as Apple calls them, you'll be able to learn a new instrument from some of the best around — including piano legend Ben Folds, actual legend John Legend and other popular bands (like Death Cab for Cutie). 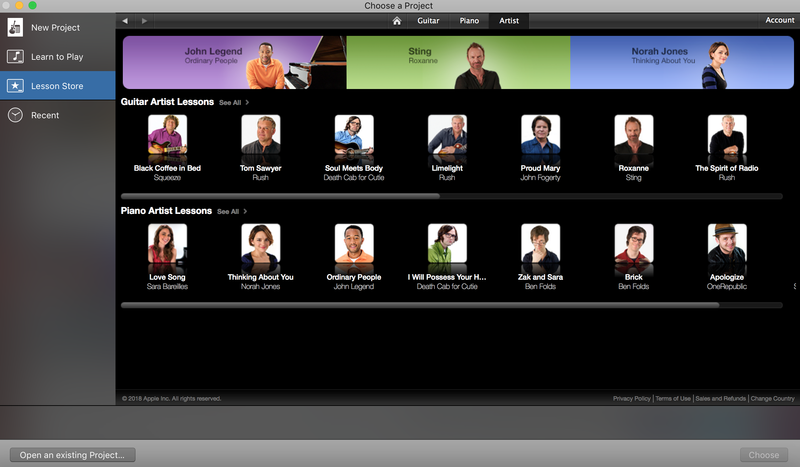 Released in 2009, Artist Lessons gives aspiring musicians a way to master songs by splitting tutorial videos into three different parts: learning the song, playing the song and the story behind the song (so you can be all emotive and such when recording your YouTube cover). Artist Lessons used to cost $US5 ($7) each and were geographically restricted, but Apple's update to GarageBand expands Artist Lessons to more than 150 countries and most importantly, drops the price to free. As long as you have an instrument — or the world's best ear — you can learn how to turn on the red light directly from Sting himself. It's no private lesson, but it's something. You can also bang on the drums all day — Guzheng, Koto, or Taiko — and give your songs some classic vibes with five vintage Mellotron patches. Get started by grabbing Garage Band for the Mac, if you don't already have it installed, or checking out the App Store and downloading the latest update.